Hi, good morning, everyone. 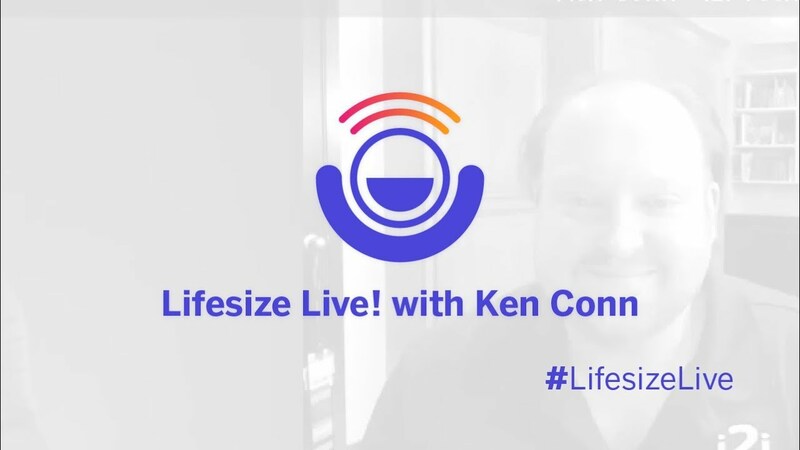 Welcome to Lifesize Live!, the live web show that's produced entirely using the Lifesize solution. I'm James Ofczarzak, and today our guest is Ken Conn, the president of the US Distance Learning Association as well as the Director of Partnerships and Collaboration at i2i Technologies. Thanks a lot for joining us today, Ken. Good to see you. Yeah, great to see you guys, too. Well, today's topic is online and distance learning and the demand for it out there today. And we're happy to have you. I want to start by looping back to a few weeks ago when our CEO Craig Malloy spoke about his 22-year wait, and recently Ken, you put out an article on the Lifesize blog where you also spoke to a similar 20-year wait as well. I quote you here — you said, "Almost 20 years later, I'm happy to say that video conferencing has finally caught up with the promise it made two decades ago." So, Ken, where were you 20 years ago, and what was that promise that was made? So believe it or not, 20 years ago this August, actually, I started teaching fifth grade in a school district right outside of Houston, Texas. So I was a fifth-grade teacher. This was 1998, so if you kind of start thinking about what was your life like in 1998 — for me as a new teacher this is when technology was starting to show up into the classroom. It was a big deal that every classroom was going to have a computer in it and a TV that we could connect to the computer, and email was being rolled out, so that was the time when educational technology started happening in the classroom. Even though I was a new teacher, that part of it was completely new for me. I was taking a lot of professional development classes related to this technology, and I fell into being this de facto go-to person for how to do internet searches and how to use all these different tech products. And the promise was that this educational technology was going to help us improve our student learning and help engage with our students. The part that was difficult was making that all work. Sure, absolutely. So tell me a little bit more. Can you speak specifically to what your role was in that? You said that you were a teacher, but also somehow you transitioned into this tech genius, by default? Right, right. So you know, I'm not a gadget guy, naturally. I really look at technology as a tool to get things done, so being this person who was learning about all these things and having people around me asking me to show them all these tech-related things made me get immersed in it. I just started using a lot of the different things in the classroom — document cameras, CD-ROMs, and so on. And so I moved up to teaching sixth grade, and these guys were working in this classroom down at the end of the hallway. I went down to check it out, and it was like, “Whoa! What's this stuff?” There were cameras in there and a big interactive whiteboard with a control room station, and that was my first introduction to video conferencing. And can you speak a little bit to your transition now to the president of the US Distance Learning Association and also your role at i2i Technologies? Yeah, it's kind of all intertwined with that. So when this stuff showed up, the school district had written a grant, had gotten awarded the grant, and had a loose idea of what classes we can teach with it. And then I was started asking when they were going to show us how to use all this new technology and when it was going to be deployed in the classroom. And at that point they said, “You're so excited about this. Why don't you help us figure out what to do with it?” And so I was on my own, trying to figure out how to do all those things. And it was a big learning curve and a big learning experience for me. We ended up going to the Texas Distance Learning Association, and that was my first introduction to some like-minded people that I had been looking for. Right, you found your tribe. Yeah, exactly. And so I immediately saw value in that, got involved in the leadership there, and became president of the Texas Distance Learning Association. And through that, my desire to really connect and collaborate with other people was growing, and the company that helped us put a lot of the technology in the school district asked me to work with them and help implement what I was doing into other school districts and with other people. So that was kind of how I expanded more into the corporate side of things and working in that area. And then I got introduced to the USDLA through my work with the Texas chapter. The company I was working at did some video communication but it was a small part, so when I got the opportunity to join i2i Technologies, who focuses on that video communication and collaboration piece, I decided that this was were I needed to be. I figured out that this was actually what I was passionate about and where I could help people best. Awesome. Can you talk about to the current demand that you're seeing kind of across the board, the demand for distance learning and kind of just video overall? Right, so we talked about that promise at the beginning, I was saying the promise was to improve learning for everybody and engage students better. I think it was a promise that was very hard to deliver on because we were often so focused on making the technology work that sometimes why we were doing it would get lost. Sometimes when we were looking at things, we almost had to reverse engineer — we had this technology and had to figure out how to help people learn with it, but now the technology has finally caught up. It is really easy to use. It's not like somebody just took all these classes and courses to learn how to use it or that you need an army of people to help you do it. You know, so I think the things that we're able to do in our personal lives have helped push our learning environments and our businesses into doing some of these things. It's like; “I can do this at home. I can connect my video to my family that is spread out all over the place, right? Why can't I do this in my learning environment? Why can't I do this at work? Just because I can't be in this one location, why does that need to be a reason I can't do this?” And so I think that has pushed the demand for those learning environments. Also, we're in this place now where we can have the best of both worlds — we can choose between when it’s appropriate to have an asynchronous environment and do things online at our own pace and when it’s more appropriate to connect over video in real time to have a quick conversation about something or to help process our understanding. Right, right. Ken, is there a specific moment in your career where all this hit home for you, where you sort of realized “This is why I do what I do”? Yeah, I mean, there have been a lot of “aha” moments when I've seen the lightbulb pop on for people. The one specific moment I remember — and this is back in the day when things were hard — was when we had a program that we did at the school district where we connected students from an alternative learning center back to their home campus to receive some of the class credit that they couldn't get otherwise. So we had a teacher and a student who both did not want to really participate in this program. I had to do a big sell on how great it was going to be. I set the equipment up in the classroom for the teacher, and when I got to the students and connected it on their end, within five minutes it was like we were all in the same space, just focused on the content. The technology just melted into the background. And that's when I realized that this technology was worth all the headaches and the prep work. Flash forward to today, and that stuff has almost completely gone into the background. You can really focus on what you're trying to accomplish and plug in the technology that helps you get the message across. Right, excellent. Well, thanks for sharing that. It's clear to me that this is an exciting passion for you, and I've been telling everybody, “You have watch today. You have to watch today.” I've never seen anybody so fired up about video, and I really appreciate you just taking time to share that with us. Thank you so much, Ken. We appreciate all that you do. And for everybody at home, just a reminder that Lifesize Live! is every Tuesday and Thursday at 11 a.m. Next Tuesday, we've got Michael Helmbrecht, who's the Chief Product Officer here at Lifesize, and he’s going to be talking about managing the chaos of video inside the corporate environment. So please join us, and again, thank you, Ken, for your participation today. Have a great day.